Baseball windscreens offer many benefits to your baseball facilities. They make the ballpark look great, block out unwanted distractions for players, while also reducing the crosswinds that can affect play. Windscreens also have the design flexibility to dynamically change the look of your field. We often get questions about where most coaches choose to put softball and baseball windscreens at their facilities. The short answer is any place where fencing exists, but there are a few key locations we would recommend. Windscreen along an outfield fence is probably the most obvious choice, and for good reason. Because this area is highly visible, it is an excellent location to make a big visual impact. By combining your team colors, logo, and branding into a carefully crafted design, you can easily give your ballpark a professional feel. In addition to elevating the visual appeal of your baseball field, an outfield fence windscreen also performs the valuable function of improving ball visibility. This is called “batter’s eye” and it helps to both maximize performance while also improving player safety. A bold design from Huron High School in MI features oversized logos and a repeated pattern. 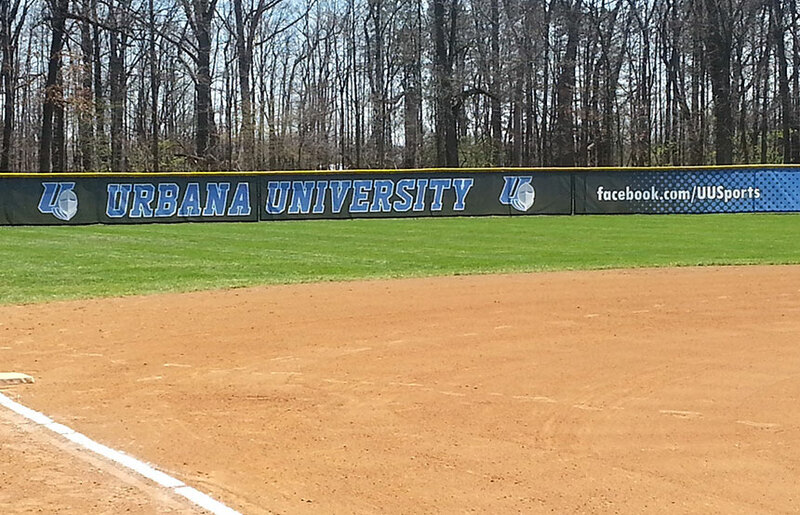 Urbana University in OH promotes their social media feeds on their softball windscreen. Often overlooked, a backstop can be an effective and eye-catching space for a custom baseball windscreen. You obviously must be careful about obstructing the view of the fans, but the tops of backstops are an under-utilized area with high visibility. Consider an oversized windscreen displaying your team name or the name of your ballpark. Another option is to highlight championships or other information that showcases your program’s history. 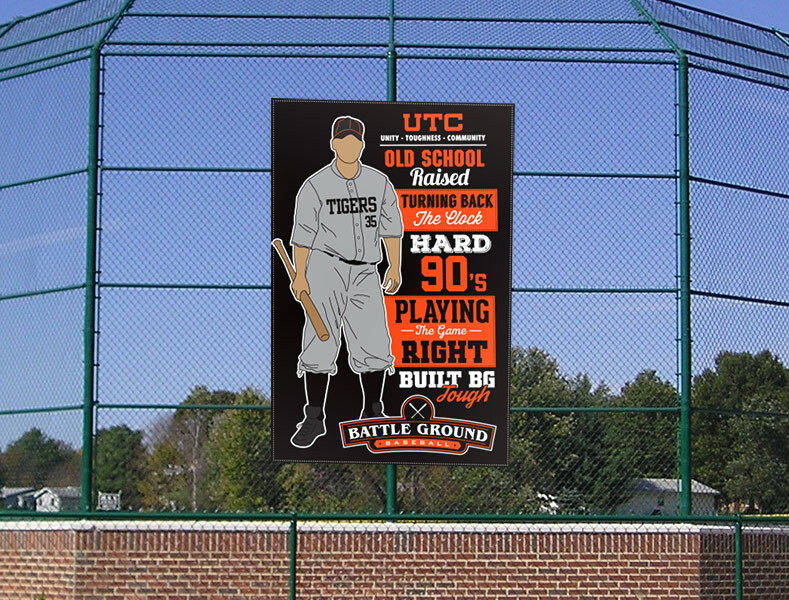 Set the tone with a backstop windscreen like this example designed for Battle Ground High School in WA. The tops of bleachers are another frequently overlooked part of a ballpark or stadium. This space can really help elevate the look of any ballpark. In addition to looking great, windscreen along the bleacher tops also help protect your fans from excess wind. 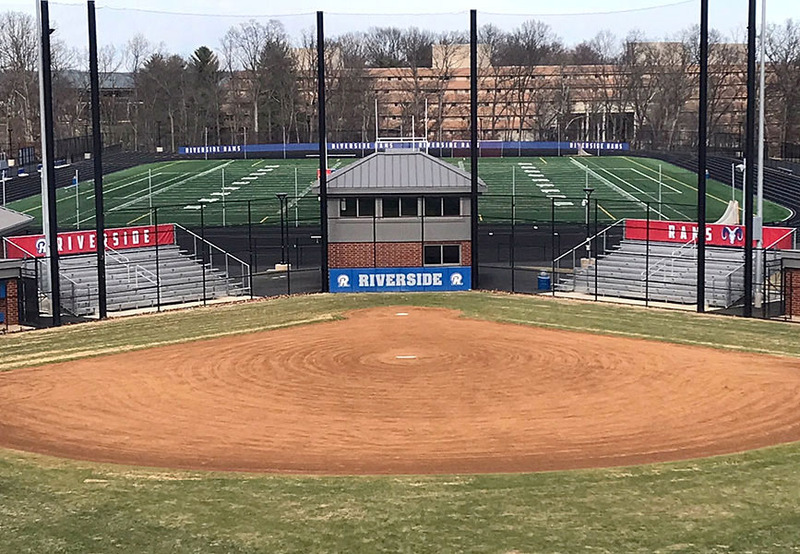 Riverside High School in VA shows off how striking windscreen looks at the top of their bleachers. Next, look for areas of high foot traffic such as a walkway or field entrance. These spaces that fans and visitors travel and congregate can be effective places to advertise your team, accomplishments, or program sponsors. 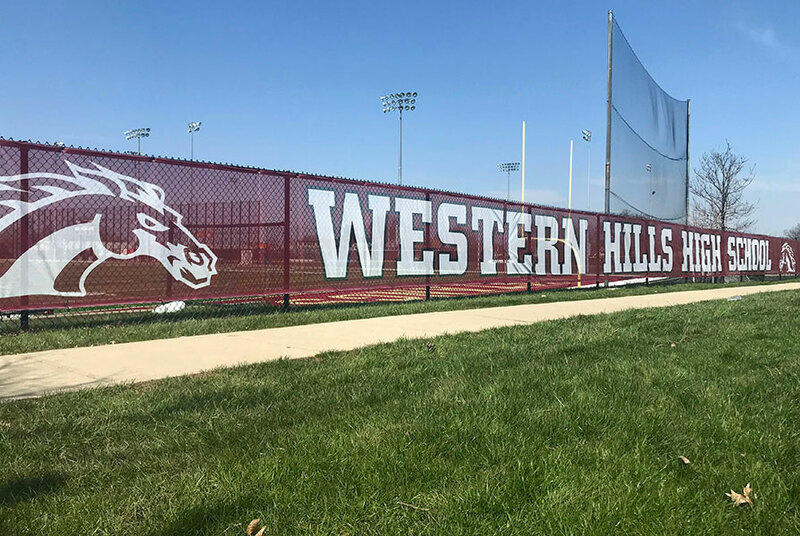 Western Hills High School in OH displays a walkway windscreen along the front of their baseball and football complex. Interested in enhancing the look of your baseball field? Reach out to a Team Fitz representative today. They can answer questions, show you examples of what other schools are doing, and go over the available options. When you’re ready, they’ll even prepare a free proposal with a custom design mock up and quote.